Your typical French toast involves deliciously sweet and oozing maple syrup and powdered sugar. This is a different kind of French toast. I don’t remember having sweet French toast growing up, we always had it salty. A couple weeks ago I had a long stick of Italian bread and a lot of company to make breakfast for so I whipped up this salty version of French toast for breakfast. 1. Beat the eggs and milk together until blended well. Season the mixture. 2. Dunk as many pieces of sliced bread into the mixture and let them soak up the egg. If you like your toast more eggy let the bread soak for longer. 3. Allow your pan to get hot, spray it with cooking spray and arrange as many pieces of bread as will fit on the pan. Cover the pan, reduce the heat and let it sit for a couple minutes. Flip the bread over to the other side when it’s ready (You want it to be slightly browned). 4. Keep the heat medium-low and allow the break to stay on for another 4-5 minutes. Check for burning occasionally. 5. As soon as you take the toast off the pan sprinkle the cheese on it. 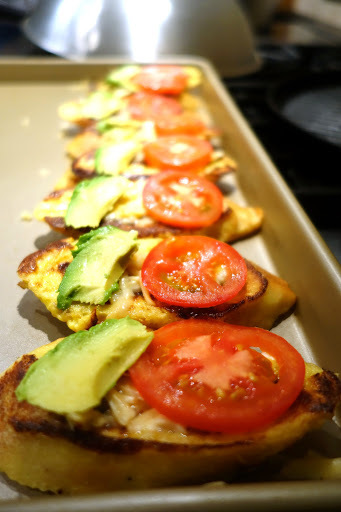 Place a slice of tomato and spoon some avocado to top it off. While this delicious and spicy breakfast can be reheated. it tastes best fresh. Enjoy! Never thought of this before. It is a great idea and you could switch the toppings out as you like. Will definitely have to try. I love the new blog!! This entry was posted on September 17, 2013 by natalyaperullo in Food.